Magenta, Black, Green on Orange follows a compositional structure that Rothko explored for twenty - three years beginning in 1947. Narrowly separated, rectangular blocks of color hover in a column against a colored ground. 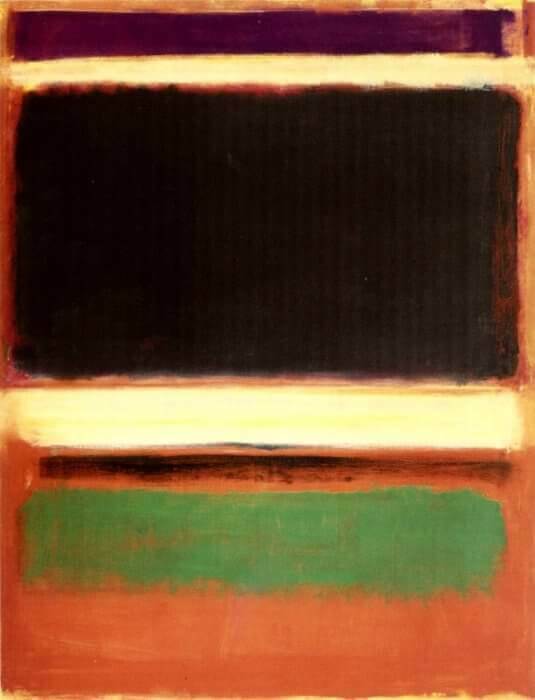 Their edges are soft and irregular, so that when Rothko uses closely related tones, the rectangles sometimes seem barely to coalesce out of the ground, concentrations of its substance. The green bar in Magenta, Black, Green on Orange, on the other hand, appears to vibrate against the orange around it, creating an optical flicker. In fact the canvas is full of gentle movement, as blocks emerge and recede, and surfaces breathe. Just as edges tend to fade and blur, colors are never completely flat, and the faint unevenness in their intensity, besides hinting at the artist's process in layering wash on wash, mobilizes an ambiguity, a shifting between solidity and impalpable depth. 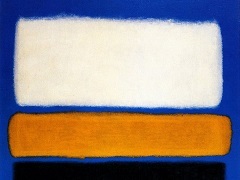 The sense of boundlessness in Rothko's paintings has been related to the aesthetics of the sublime, an implicit or explicit concern of a number of his fellow painters in the New York School. In fact, the remarkable color in his paintings was for him only a means to a larger end: "I'm interested only in expressing basic human emotions - tragedy, ecstasy, doom," he said. "If you . . . are moved only by . . . color relationships, then you miss the point."